Packing is one of the most essential parts of any move. Proper packing ensures that your items won’t be damaged during the move, and that space inside the moving truck is maximized. To get started with your packing, you will need boxes and packing materials such as packing tape, a marker, scissors, and also bubble wrap, tissue paper or other soft materials that can be used for padding. Newspaper works too, but only use it for outer wrapping and cushioning, and wash your hands frequently as the ink can sometimes rub off. Then, consider designating an empty space, with enough room for two tables, specifically for packing all of your items. It is a good idea to use a large covered table, and also a second table nearby for soon-to-be-packed items. If you need help, we have a useful “How To Pack For Your Move” section at the bottom of the page. If you’re looking to purchase packing materials, Stevens Worldwide Van Lines has a great form for buying materials. We have a packing price list so you can get an idea of what My Guys Moving charges for packing materials. It is important to select the proper size of box to use for your packing. To minimize damage, select boxes suitable for your items. Make sure that your boxes are not packed too heavy as they can break open, or too light as they can crush when stacked. The 1.5 cubic foot box, or the “1.5”, is the smallest general-purpose box that we have. It is typically used for smaller, heavier items, such as books, CDs, DVDs, canned goods, tools, etc. It is important not to over pack the boxes, as they can get extremely heavy very quickly. The 3.0 cubic foot box, or “3.0”, is the all-purpose box. They can be used for anything from small kitchen appliances, pots and pans to smaller lamp bases, and small wrapped picture frames. The 4.5 cubic foot box, or “4.5”, is the largest general purpose box. The 4.5 is typically used for packing large, bulky items such as linens, larger non-breakable kitchen items, coffee pots, pillows, blankets, lamp shades and larger children’s toys. As the name implies, the dishpack (sometimes called a dish barrel) is used for packing dishes and china. The dishpack has multi-layered construction that makes it the safest and strongest of all moving boxes. Dishpacks are recommended for all breakable kitchenware, china, and crystal. Typically each item is individually wrapped before it is put into the dishpack to give extra protection to your breakable kitchenware. For local moving, we do not require, but we strongly recommend, that mattresses be packed in a bag, however we do have mattress cartons and bags for longer distance moving. Mirror cartons are constructed of 4 individual pieces, so they can be made smaller and larger, based on the size of the item that needs packing. Mirror cartons are typically used for packing mirrors, pictures and small glass table tops. Wardrobe cartons are specially constructed and used for transporting hanging clothing during your move. For local moving, we do offer used wardrobe rental for half the price of getting new wardrobe cartons. 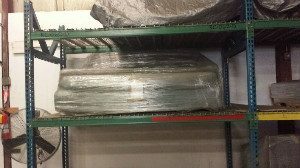 My Guys Moving & Storage recommends using dishpacks for china, glassware, and crystal. Make sure to place plenty of cushioning material in the bottom of the carton and between layers, to provide maximum protection for your china. Wrap each item in several sheets of clean paper. Begin wrapping items from the corner of the paper, tucking the edges as you roll. Place items in the box with rims down. Remember, the heavier pieces go on the bottom! Plates should be wrapped individually using several sheets of paper. Start from the corner, wrapping diagonally, continuously tucking in overlapping edges. Bundle four to six plates in a double layer of newspaper. Place bundles in a row, standing them on edge. Surround each bundle with crushed paper, being careful to leave no unfilled spaces, as movement of the packed items can lead to damage. Stand shallow bowls on edge. Deep bowls (such as mixing bowls) are nested two or three together, on their rims. Wrap sugar bowl lids in tissue, turning them upside down on the bowl before wrapping them together. Place sugar bowls, pitchers and similar pieces upright in the carton. Cups and glassware should be wrapped in a double layer of paper and placed on rims, in a row, on the upper layer within the box with all the handles facing upward in the same direction. Loose flatware may be wrapped either individually or in sets, in clear plastic or tissue. If the silverware is in a chest, you still may want to wrap the pieces individually and replace in the chest. Fill in all empty spaces in the chest with tissue paper or paper toweling. Since air causes silver to tarnish, all silver pieces should be completely enclosed in fresh, clean tissue paper or plastic wrap. Silver bowls, tea sets and serving dishes should be carefully wrapped as fragile items and packed the same as china. Because books are heavy, use small cartons. Pack on edge, alternating bound edge to open edge. Pack books of same general size together. After removing the light bulb, wrap the base, harp and bulb separately, in newsprint, and place together in a box, filling spaces with crushed paper. Carefully wrap each shade in three or four sheets of fresh tissue paper, a pillow case or large lightweight towel. Large, Tiffany-style lamp shades and chandeliers should be packed in a crate. Your Stevens representative can arrange to have a custom crate built. For packing and moving glass or marble table tops, mirrors and artwork locally, our movers can wrap them tightly and safely in moving blankets to protect them during the moving process. For long distance moves, it is best to consult with your My Guys Moving & Storage customer service representative about obtaining custom-made cartons or crates for these items. Footwear may be left in shoe boxes and placed in large size boxes. Shoes may be wrapped individually, then in pairs. Footwear should be cushioned to avoid damage occurring to high heels or ornaments. Do not pack heavy items on top of shoes. Leave clothes on hangers and transport in wardrobe cartons. You may remove garments from the hanger, fold and place in a suitcase or lined box. Some lightweight clothing such as hosiery and lingerie may be left in dresser drawers. Because linens are lightweight, they can be used for padding delicate items or folded and placed in larger, lined boxes. Draperies and curtains may be folded and packed in larger, lined boxes. An alternative is to place the items on hangers in a wardrobe carton. Leave rugs on the floor for the mover to handle unless they have just returned from the cleaners. Carpets will be rolled and stretch wrapped prior to placing them on the truck. If possible, carry all valuables and photos with you to your new destination. Photos are best protected in albums; any framed photographs should be wrapped and bundled similar to plates. Loose photos should be secured and protected from damage. My Guys Moving & Storage suggests packing photographs in separate boxes for the moving process. Small clocks, radios and similar items can be packed in the same carton, or with the linens. Wrap items individually using several pieces of paper, and place in the packed box with plenty of crushed paper. Large appliances must be serviced and dry before moving. 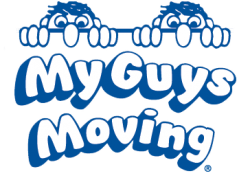 Be sure to tell your My Guys Moving & Storage customer service representative about any appliances you may be moving, so we can make sure to send out the proper amount of men to move these items safely and effectively. Front load washer drums need to be “locked”, ask us about this before the move. Hand tools may be left in tool boxes, fill spaces with crushed paper, or the tools may be packed according to general packing rules. Always use small boxes because tools are generally heavy. My Guys Moving & Storage is a member of Move for Hunger, a non-profit organization made of moving companies around the country who donate non-perishable goods to local food banks. If you’re moving with My Guys Moving, just ask us for some specially marked boxes that you can put your non-perishable food into, so we can donate it to those who need it.